The ACLU finds that SWAT teams spend more time kicking down suspected drug offenders’ doors than rescuing hostages or stopping gunmen. Seven-year-old Aiyana Stanley-Jones was shot to death by a SWAT officer during a midnight raid in Detroit, moments after a flashbang grenade lit her blanket on fire. The mayor of a small Maryland town and his spouse were held at gunpoint for hours on unfounded drug allegations, during which time officers shot and killed their two dogs. A SWAT officer’s flashbang landed in a baby’s crib, blowing a hole in the 19-month-old’s face and chest. In a new report, the American Civil Liberties Union ties each of these tragic stories to the increasing militarization of America’s police forces, a trend financially and materially supported by the federal government. The report, titled “War Comes Home,” finds that SWAT teams, equipped with assault rifles and armored vehicles, are mostly used to search suspected drug offenders’ homes, rather than rescuing hostages or stopping active shooters. ACLU Researchers examined 818 SWAT incident reports, filed between 2011 and 2012, from twenty police departments in eleven states. The data, obtained through public records requests, was collected by local ACLU affiliates over the span of a year. The data lends credence to long-held assumptions that SWAT teams primarily serve to fight the War on Drugs. Of the deployments examined by the ACLU, 62 percent were for drug searches, while nearly 80 percent involved search warrants. In contrast, only 7 percent of deployments responded to hostage, barricade or active shooters, the types of emergency situations for which SWAT teams were originally created. At least 36 percent of drug search deployments, and as many as 65 percent, turned up no evidence of contraband. As with other components of the War on Drugs, the SWAT raids examined by the ACLU disproportionately targeted people of color. Of people impacted by the ACLU’s sample of paramilitary deployments, 37 percent are black, 12 percent are Latino and 19 percent are white. 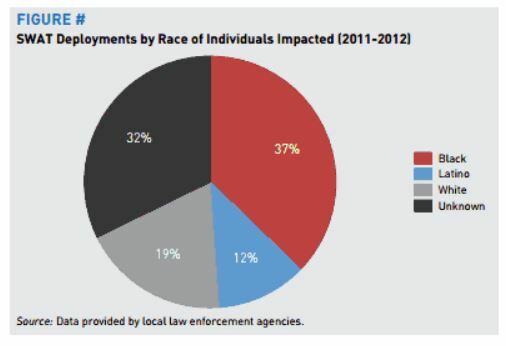 Another 32 percent are of unknown race, because some police departments failed to record that information. The scope of police militarization in America would not be possible without the help of the federal government. Programs run by the Defense Department and Department of Homeland Security provide millions of dollars’ worth of military equipment to police departments every year, while grant money from the Justice Department is often used to buy weapons and body armor. For example, the North Little Rock Police Department in Arkansas received thirty-four semi-automatic rifles from the DOD, along with two MARCbots (military robots used in Afghanistan), ground troop helmets and a Mamba tactical vehicle. 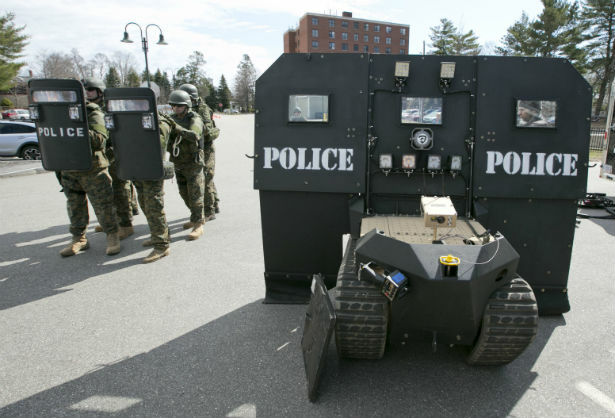 Kara Dansky, senior counsel at the ACLU and the report’s lead writer, said it is currently impossible to conduct a comprehensive analysis of police militarization nationwide, because there is very little public oversight of SWAT teams. Researchers found that data collection among police departments was “at best sporadic and at worst virtually nonexistent” in the context of SWAT.